Guide to Hiking With Your Dog + Best Dog Hiking Gear Reviews for 2017! Why leave your dog(s) at home if you want to go out hiking? More and more, we’re seeing people take their dogs out on hiking trails. Whether it be for just an hour or two for a nature detox and some exercise, or multi-day hikes with camping. It’s now easier than ever to take your four legged family member to beautiful new places that you can experience together. Depending where you live, regulations can be in place that allow or disallow the bringing of dogs to certain locations, such as national parks. These are in place to protect the environment and wildlife. Only take your dog hiking and camping in locations where it’s legal – then you’ll have nothing to worry about. Do dogs really need to wear boots when hiking? Not like we do. But if you’re planning on hitting some rougher terrain, consider your doggy’s paws. While dog feet are made to withstand some pretty tough conditions, a lot of people feel more comfortable with some paw protection. 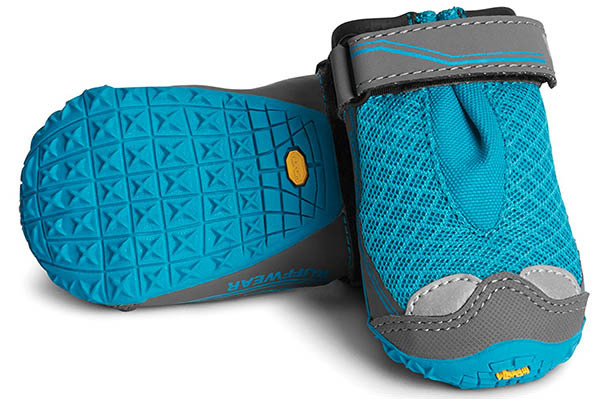 In what situations would it be a good idea to consider hiking shoes for your dog? So it’s certainly not just hiking where shoes for dogs might be used, although that will be the main focus in this particular guide. The whole idea of dog shoes is to protect the feet, without hampering movement. Dogs have amazing dexterity in their feet which allow them to handle terrain like rocks and the like with much more ease than we generally can with bare feet. So the last thing you want is to make it harder for your dog to safely, effectively and confidently walk on these surfaces. That’s why I would be very careful in which boots are chosen. 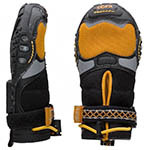 Dog shoes for walking outdoors and hiking are different from regular paw protector type shoes which lack the more durable features that you’ll need for more harsh environments. Just like a pair of top quality hiking boots for us – it can make all the difference between pleasure and pain, or in a dog’s case, being able to walk freely, or being held back by a poorly designed quad-set of shoes. It’s better to have no shoes than a bad pair of shoes! Another consideration is whether the shoes are waterproof. Many are, but if you plan on wading through water, or even just walking on damp ground, you’ll want dog boots that won’t retain dampness which can lead to coldness, discomfort and potential foot health issues. Non-slip: The under surface of the boots ideally should have a good grip, like our human hiking shoes, to prevent slipping. This is particularly important if your hikes will take you over streams and creeks where mossy and wet rock surfaces can be a slip hazard even for the most dexterous of dogs. Good fit: We don’t enjoy wearing shoes that are either too small or too big, and either do dogs. Too large and the boots will be a safety hazard, and too small shoes can result in pain and a dog that is not going to enjoy her walks, especially longer hikes. You’ll want the boots to fit well and securely so they stay on AND provide the best possible comfort. 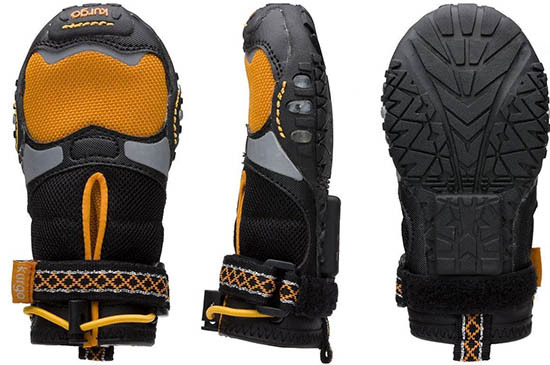 The best dog boots will have some expansion capability to ensure the best fit and comfort. 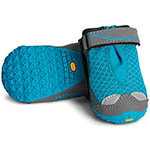 Durable: If the stitching on your dog’s shoes becomes undone, she could quickly lose her shoes. A good dog boot will have high quality stitching and be made to ensure that the sole is not at risk of becoming detached from the rest of the shoe through poor stitching. Easy to put on: You might be lucky enough to have a dog with endless patience, but for many of us we’re probably not going to be able to spend half an hour trying to get 4 shoes on. The easier and faster it is to get each boot on your dog’s paws, the quicker he’ll be able to happily run off and you can get out there. The best shoes will usually have a velcro opening that allows you to smoothly slip in your dog’s paw then secure and tighten the shoe with the velcro strap. You could consider these the top of the line option for the serious hiker. Want the best all terrain boots? The Grip Trex tick the boxes. And while they’re not perfect for everyone, you’ll be hard pressed to find better when it comes to design and quality. 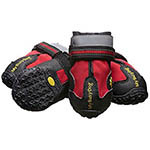 You’ll want to do a careful foot measurement before deciding what size to get of the Ruffwear shoes. They don’t just come in a few sizes, but are made to very specific measurements covering a huge range of foot sizes in small increments. You can buy a set of 4 in one size, or 2 different sets of 2 in different sizes to suit front and back feet. Every size is covered to cater for just about any dog: starting from 1.5″ and rising in increments of 0.25″, right up to the largest size of 3.25″. Needless to say, taking a few minutes to accurately measure your dog’s feet is going to have big benefits when you can select just the right size for each foot! This helps you to get the absolute best fit for each foot. This sort of attention to detail is another thing that helps the Grip Trex stand out from other boots. Serious hikers, long hikes in rough terrain. 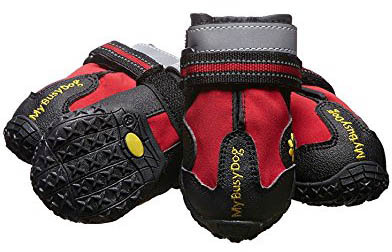 These are another set of dog shoes that are designed especially for tough outdoor use. With anti-slip rubber on the bottom, and being waterproof, they’re an ideal choice for times where you might be walking over rocks and slippery areas. But it’s not only slippage that a thicker, tougher sole helps with. It also helps prevent thorns and other sharp grasses and plants becoming painfully stuck in your dog’s feet. A badly placed thorn that becomes deeply embedded in the foot can not only bring your hike to a halt, but make it difficult for your dog to get back to camp or the car if he’s in pain or discomfort. They’ve tried to make the sizing similar to that of human shoes, by using single numbers. But the numbers are just a scale, and you’ll still need to measure your dog’s feet as best as you can in order to select the best fitting size. Wet areas, slippery, spiky and rocky terrain. Letting your dog off the leash on a long hike brings much joy and freedom, but there will no doubt be times and places where you’ll want him to remain on the leash. A leash that will stand up to rugged terrain and not give you trouble means that you’ll want to look at some of the tougher, better ergonomically designed leashes out there rather than the type that you might use at the local park. Comfort – for both your dog AND you. A leash that isn’t comfortable to hold in your hand for long periods of time, and over rougher terrain, is not one that you’ll want to use. A good, comfortable grip is paramount. Durability – You need a leash you can rely on out in the wild. If it breaks, it can ruin a trip. Ideally, taking a spare leash is the way to go. Even then, both should be of a quality that exceeds that of your basic use-at-home dog leash. Length – freedom is what hiking is all about, so having your dog on a short leash in a lot of cases is probably not what you have in mind. But letting him off leash might not always be safe, allowed, or desired. So the best solution and compromise is a quality leash of a good length to allow a nice degree of freedom, while still giving you control. If you’re going on a multi-day hike, or even just for a few hours, you might think about packing a basic first aid kit. But will a normal human first aid kit cover everything that your dog might need in case of an injury or emergency? In most cases, yes it will. There’s not a whole lot extra that a dog would require in a first aid package, but having your own little doggy first aid kit means that you can keep their items separate, and take it with you wherever you go, not just hiking, as well as keeping it on hand around the home. It’s not just injuries where a first aid kit comes in handy, but the more common occurrences when you’re in the outdoors like ticks can cause big problems and not everyone is an expert at removing them without proper equipment. So having a first aid kit that covers the basic scenarios is also important. Whether you’re making your own or buying a kit, knowing what the absolute must-haves are will save you a lot of heartache if you’re out somewhere far away and you need that specific item that you don’t have with you. So what should be included in any first aid kit for your dog? You can either put your own first aid kit together, or buy a pre-packaged first aid kit that has been designed especially for pets. The benefit of putting your own together is of course that you can make it any size you want, include only the things that you think you might need (although this is more difficult to decide on than you might think), and you might save a little bit of money as you can pick and choose each component. Obviously, the benefit of buying a ready-to-go dog first aid kit is that you don’t have to worry about forgetting something, and you’ll save time by not needing to search for and decide on each and every part of the kit. You also get the advantage of having the kit put together by someone who has thought of almost any scenario that a dog might need first aid, and what items would be needed. This turns it into something that you can not only take with you on a hiking or camping trip, but also use at home as well in an emergency before taking your dog to the vet. While most pet first aid kits contain the things you would expect to see in any first aid kit, and often just have a few dog-specific items included on top, the way it’s packaged is also what makes these appealing and they are well organized, light weight and take up very little room. The American Kennel Club (AKC) has put together a pet first aid kit that has 50 items in it (a smaller 20 item kit is also available). That sounds huge, but the bag itself is more than compact and light enough to put in a hiking bag. It covers everything from tick removal, to biting insect relief, up to more severe emergencies you might (but hopefully not!) experience out there. The Canine Friendly Pocket Pet First Aid Kit is another option we have. This one can be attached to the outside of your backpack if you prefer, as it has a carabiner on the top. This is a pretty basic first aid kit, and that’s reflected in the very light weight and small size; it’s about the same size as a standard photo print of 4×6″. But it covers the basics well: latex gloves, first aid tape, gauze pads, gauze bandage, antiseptic wipes, adhesive and elastic bandages. Also included is a pamplet containing pet first aid information. Something that might not be included in all first aid kits is an item that you’ll want to be carrying with you: the very useful styptic powder. It’s a simple, safe way of helping to stop bleeding. It can be safely used on dogs when they experience minor cuts and grazes, and is an invaluable first aid tool. Miracle Care Kwik Stop is made especially for animals, and is small, easy to slip into your first aid kit or bag, and is one of those must-take items that no hiking trip should be without out. Space is at a premium in your hiking bag, so carrying a hard metal or ceramic dog bowl is not likely something you want having taking valuable pack space. Not to mention the extra weight. A good bowl to take on a long walk or camping trip is one that takes up the least possible space in your bag. Collapsible bowls are ideal as they are both lightweight, take up almost no space when not in use, and are low cost. Something like the Outward Hound “Port-A-Bowl” can be used for either food or water. The material is fast drying so you’ll be able to fold it up and store it away soon after your dog has a drink. Even though it’s a soft material, the nylon structure is more than tough enough for the bowl to keep its shape even when filled with water. The last thing I want is to waste water on a long hike, so having a bowl that contains it as best as possible is really important. Then we just have to make sure the dog knows it’s not for playing in or splashing around! Gone are the days where you have to carry everything your dog needs for a hiking trip. That doesn’t mean your dog has to get weighed down carrying gear – that’s the last thing we want to do. But a well designed, comfortable ergonomic doggy backpack can be worn by almost sized any healthy dog. Whether it’s just a water pack or one that can also hold some snacks, picking the right one is absolutely vital if your dog is going to enjoy the experience of wearing it. 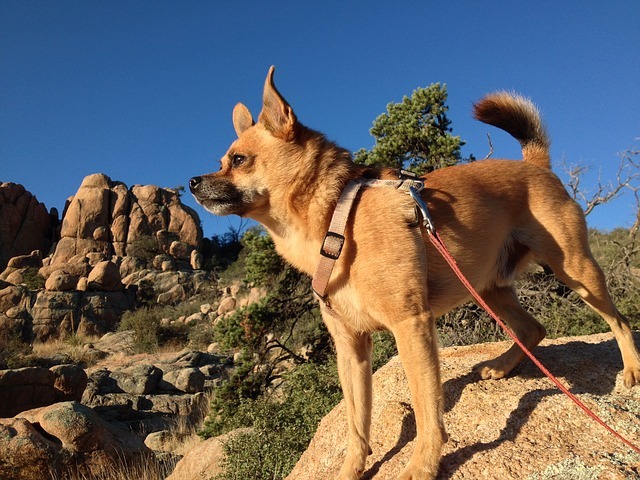 What should you be looking for in a hiking pack for your dog to wear? Obviously, their comfort level is going to be top priority. The last thing you want to do is weigh your dog down, or have a pack on that restricts his movement, digs into him, or is just plain uncomfortable. That means buying a well designed, well made pack that has good padding in the all the right places. The backpack has to fit well on your dog. Too big and it’s going to flip and flop around and annoy her, and onbviously if the rucksack is too tight we’re going to have big problems with comfort levels and if it’s way too tight fitting it becomes a hazard. Rmeember when you’re hiking your dog is probably going to get puffed out at certain points and the last thing you want happening during that heavy breathing is for the pack to be restricting the chest. The best backpacks are of course adjustable, but you’ll still want to choose one that has an overall base size that’s suited to your dog. Removable packs: you should be able to easily remove the storage packs when you’re on a rest stop. This takes some weight from your dog, the same way that you’ll rest your pack on the ground when taking a break from walking. Waterproof design is most ideal, although it will be a higher priority based on where you live and what the climate is like; as well as how long your hikes are going to be. Good visibility: If your dog is going to be walking off leash or on a long lead, having that bit of extra visibility on the backpack can help you keep an eye on her in darker environments. This backpack comes in one color only: blue. It’s a bright blue and designed to provide good visibility. Blue is a color that generally does not camoflouge well, so if your dog gets ahead of you you should still have good sight with this bag. It’s also accented with reflective material to add extra visibility. 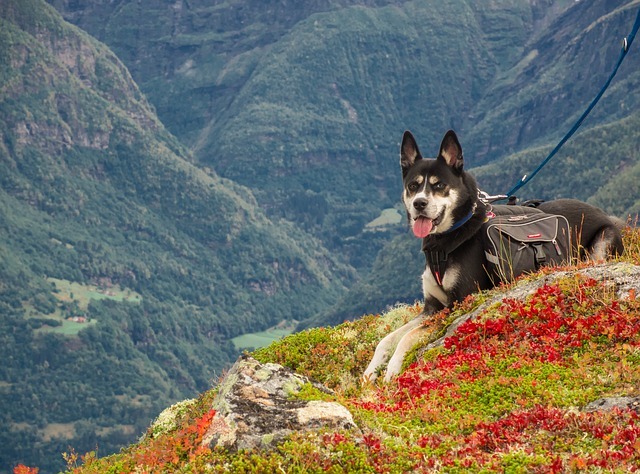 In general, visibility is not going to be a top concern wehn buying a saddlebag for hiking, but it’s always better to have one that excels in this area especially if you plan to have your dog running free off the leash. Included with this bag is a collapsible bowl. On top of the harness is a wide handle that you can grip if you need to in an emergency to stop your dog from jumping or pulling ahead. Although it’s not something you’re likely to use often, it’s a good feature to have and gives you more control – and less strain on your dog – than pulling hard on the leash. Waterproof qualities is another important area to consider if you’re going on longer hikes, or just live somewhere where rain is more likely OR your dog is likely to come into contact with some water while you’re out adventuring. The Ruff Armor backpack can sustain light rain. That means it is not 100% waterproof and can’t be immersed in water without the contents of the bag, and the bag itself, getting a soaking. In essence, this means that this bag is weatherproof, but not waterproof. You’ll be pleased to know that the internals of the collapsible bowls are indeed waterproof though – as you would need them to be if you’re going to be able to keep them clean and hygenic.